The last build shown was at E3 but, unlike many AAA-developers, this was the latest developer build, not just a small demo created for the sole purpose of demonstration. The particular build at Rezzed was being worked on the same morning before the showing, Rocket tweeted that he had finished it just an hour before the talk. So a lot of the stuff here will not be new for you if you have watched all the E3 content, but this is the very latest build. So, here goes. DayZ Standalone has been in development for less than a year, but there are already a lot of new and exciting features in the pre-Alpha game. The decision to go Standalone was made to prevent hacking and to smoothen the experience, but since the announcement Rocket has put a lot of new features and detail into the world. Rezzed-goers were lucky enough to see the very latest build, and it was quite obviously early. The zombie animations are still pretty shaky, not too dissimilar to those in the DayZ mod. When the animations broke, Rocket lovingly said: “Yeah. That was really sub-optimal” to many chuckles from the audience. 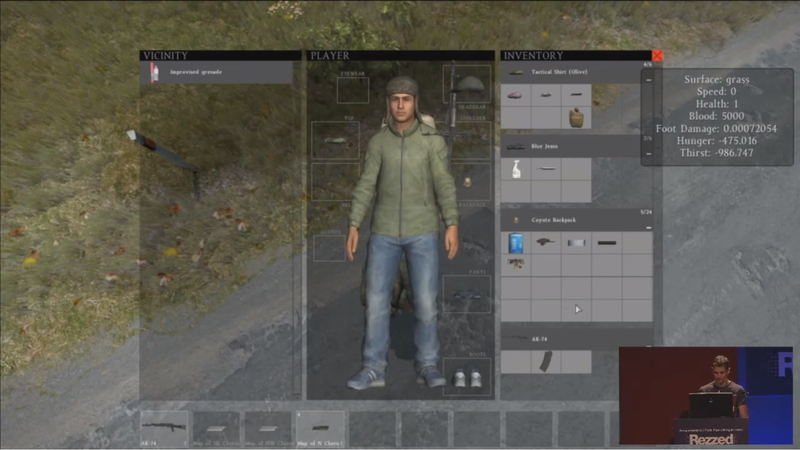 In terms of the actual build, one of the biggest changes is the much-wanted new inventory system. This means not just a new user interface (UI), but a fancy crafting system. Rocket demonstrated it at Rezzed, combining map fragments to create a full map. There are also improvised weapons; you can use duct tape to combine a flare with a spray can to create an explosive. Crafting gives the player a plethora of new options when it comes to survival. You can use a gas cooker, but you will need to attach a gas canister to it for it to work. When you attach or combine items, it changes the visual so you can plainly see that there is a gas canister attached to the cooker, and with the improvised explosive, you can clearly see that it is nothing but a flare, duct taped to a spray can. Radios are another new addition. Rocket was revelling in the 80s music he had playing in the background as he ran around a Chernarus village. Radios can be used to broadcast a pirate radio station which will be run by the community, a regular internet radio station. There will also be radios for communication between players which would lose signal over distance. The mobile radios have a multitude of uses. There is a great potential to “troll” players, Rocket said. You can drop a radio on the floor, leave some music playing and nearby players can hear it. The zombies will also be attracted to radios and they will be able to destroy items they come by, including abandoned radios playing 80s music. 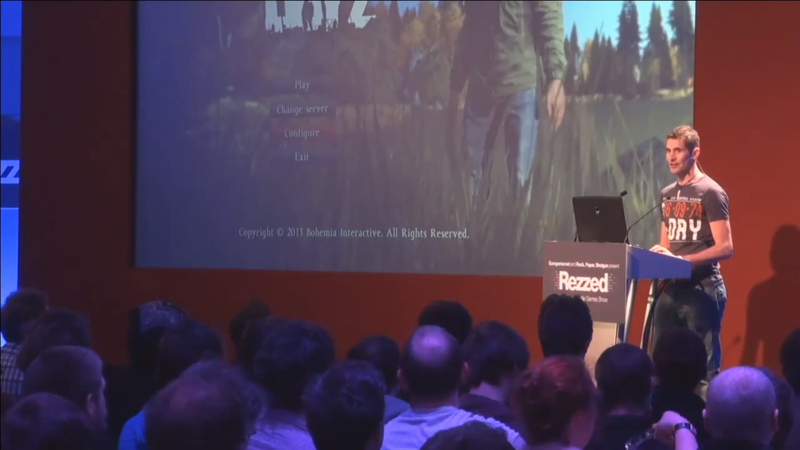 In terms of the UI, DayZ Standalone is going to be an immersive experience, removing pretty much all of the interface. Rocket wants everything to be either visual or audible, sometimes both. The only HUD in the current build is a quick bar at the bottom of the screen, which allows you to switch weapons, eat food, etc. Even this quick bar disappears when you run around and don’t use it for a while. During the Q&A, a few people asked Rocket about feature that are in the ArmA 3 Alpha, but DayZ is definitely a different game now. Rocket said: “ArmA was never really designed for anything we’re doing. The zombies in DayZ are, obviously, one of the key aspects of the game. In order to balance things like graphics performance, the team have had to compromise. The zombies will be one model, this means that instead of a textured body with several pieces of clothing and equipment on it, they will just be one model of body and clothing altogether. This allows more zombies on the screen and, thus, better performance. This is important for lower-end machines which, Rocket says, he wants it to be playable for more than to be a more specific experience for those with better computers. Keeping this in mind, the game will have set graphical features, so they will be the same value for everyone. Features such as view distance and how many trees and foliage are on the screen at once. This is to counter people gaining a considerable advantage in the mod by lowering their graphics options. The game still looks great, though, and the team started motion capturing some damaged animations this week, this means that when your character has an injured leg they will actually limp around, and have an obviously hindered movement speed. This is one way that you see what problems your character is enduring. Dean Hall is itching to release the Alpha so he can start getting player feedback straight away. He announced at Rezzed that they have “set a date now, a window of about a week” but are not announcing it yet. Sounds like it could be soon, make sure to keep up to date via the devblog here.